In this episode, I introduce the seven steps to creating a time blocking success schedule along with my top eight tips to aid in its creation, discuss the foundational strategies to maximize productivity, and talk about why it’s important to go slow to go fast when it comes to productivity. I also reveal the secret to not double-book yourself, what you need to hold sacred in order to be successful with time blocking, and which activities you absolutely need to plan for because they tend to creep in and take over your entire day. Now let’s get to the straight talk! 0 Gimme A Break! Who Has The Time? Who has time for a break? Not me! I am certain you have said some version of that phrase to yourself more often than you would like. Perhaps you may feel that to be most productive the best choice is often to work right through the day, put in a straight 8 to 12 hours consistently, eat at your desk, and work right through possible breaks. I mean, come on, who has time for a break? If you’re going to construct a building, you don’t just start placing bricks on the ground, piling them up high, and slapping some mortar in between each one without a plan. You’d be sure to fail. Benjamin Franklin said, “If you fail to plan, you are planning to fail,” and he’s absolutely correct. No matter what you set out to achieve, you must take the necessary step of creating a plan, often one with many if not hundreds of steps and components. Constructing a building is important work. You don’t want it to fall down because it’s poorly designed or haphazardly engineered. You need a plan. Each one of your days is important work, too, because they set up the foundation for your months, your years, and your life. It’s vital to create a plan for each of your working days to ensure you’re setting yourself up for success. The good news? Creating your daily plan only needs to take about 15 minutes each day if you utilize the 5 Daily Planning Pavers. They lay the groundwork for a productive day, day after day, year after year. You’re a business owner – a busy one I imagine, and one who would love the time to be able to grow your business. The answer is increasing your productivity. The internet is full of tips on how to lose weight, create your own hair mask, fix a computer issue, and don’t even get me started on the vortex that is searching on Pinterest for “Kids Birthday Party Ideas.” The internet is also stocked with tips on how to increase your productivity, so many though, that choosing which ones to implement could be overwhelming. Being productive is not exactly easy. Otherwise, most people would be less stressed and accomplish much more. Being productive takes hard work, consistency, and commitment which can be an even greater challenge if you travel for business. Traveling disrupts the systems you’ve established for how you normally get your work done. 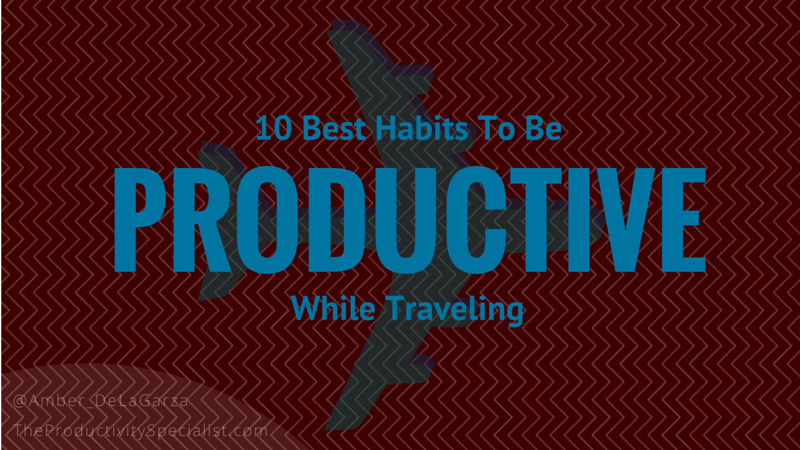 The key to being productive while traveling is to create good habits that enable you to continue working at your best wherever you find yourself.